Trapezoid fingerboard inlays featuring the exact pattern used on vintage 1950’s Les Pauls. RetroSpec Les Paul fingerboard inlays will age just like original vintage Gibson inlays. Made from vintage correct cellulose nitrate material. Manufactured by Mazzucchelli, the original Italian factory that supplied Gibson in the 1950’s. Retrospec inlays are 0.070″ in thickness, with the pattern running all the way through to allow for sanding. 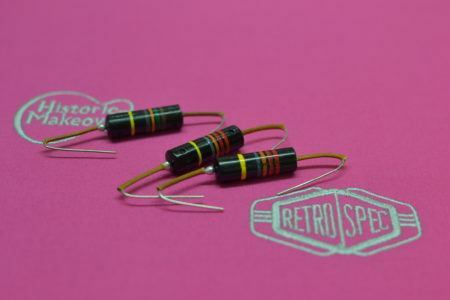 Retrospec has refined the color to achieve the correct hue, for authentic vintage vibe, right out of the package. Each inlay has a different pattern. Luthiers and restoration experts use RetroSpec inlays to restore vintage 1950’s Gibson Les Paul guitars, and also to update modern Gibson Historic Reissue Les Paul guitars with a more correct look. Inlays laser cut to ultra-smooth edges, for a perfect drop-in fit. RetroSpec Inlays can be adapted to fit other Gibson models with trapezoid inlays.